The budget of Dr. No allowed for three lounge suits for Sean Connery: one dark grey flannel (pictured above), one light grey mohair (pictured below) and one grey glen check. These suits were tailored by Anthony Sinclair on Conduit St. in London, off of Savile Row. Sinclair was also Connery’s tailor for From Russia With Love and likely beyond. 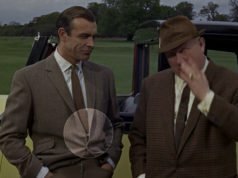 In the five Bond movies Connery made in the 1960s, all of his suits had a button two front, four-button cuffs, double-forward pleated trousers with turn-ups (cuffs) and button side-tab waist adjusters. Sean Connery’s Bond never wore a belt or braces with his suits. The parts of the suits that changed were the jacket pockets and vents. 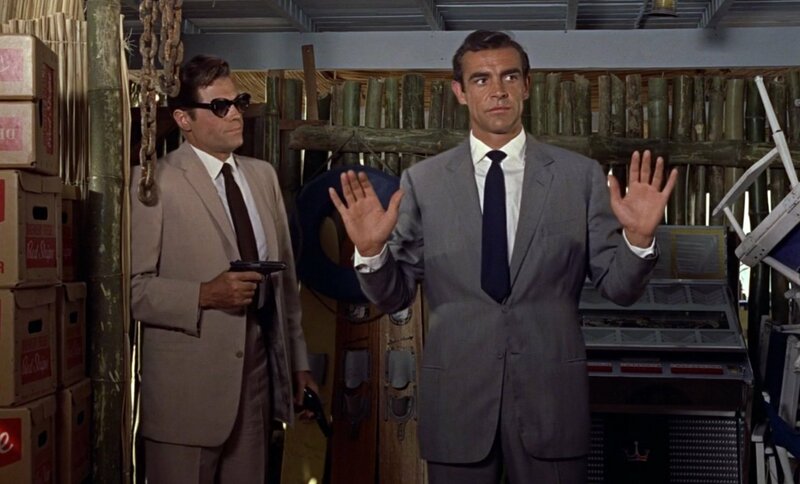 In Dr. No, all of the suits had jetted lower pockets without flaps and double vents at the back. After Dr. No the lapels and ties started to narrow, but here the suits are as timeless as can be. 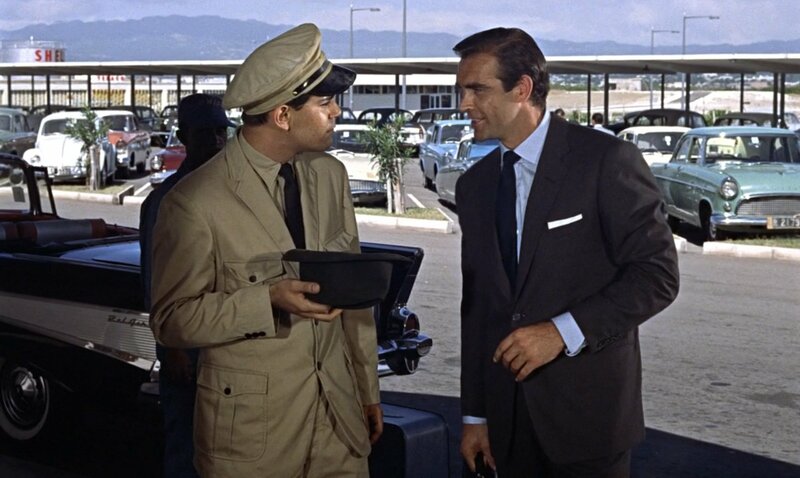 As for the shirts in Dr. No, they are all light blue or white Sea Island cotton poplin from Turnbull & Asser and feature a cutaway collar similar to their Regent collar that they make today. The shirts have a narrow placket down the front and no breast pocket, of course. A unique feature of the shirts is the two-button cocktail cuffs, which will be the topic of the next post. The ties are all dark navy blue grenadine ties from Turnbull & Asser as well. There is much confusion surrounding the grenadine tie and later in the week I will touch on that further. In Dr. No, James Bond ties his ties with a Windsor knot, something that Ian Fleming’s Bond despised. This and Diamonds Are Forever are the only movies where Bond uses a Windsor knot, but thankfully in all the rest he ties a four-in-hand knot. See more about the light grey suit in a comparison with the light grey suit Connery wears in Diamonds Are Forever. And now read new articles fleshing out the dark grey flannel suit and light grey mohair suit. I found your blog through Ask Andy, and I must say I'm very happy with it thus far. For the longest time, I've hoped for a definitive catalogue of how Bond's style has evolved and changed along with men's fashion over the past 40+ years. I even considered embarking on such a project myself, but I'm far too lazy! PS: I know Fleming's Bond mistrusted men who tied Windsor knots, but I must confess my love for them, especially the double Windsor. Fun! I watched these film with my father when I was young, and Bond has always been an inspiration for sartorial adventures as well as international adventures. Please keep it up! I like the idea – keep the posts coming! how much of padding would there have been in the shoulder…in the photo above it seems that the jacket shoulder extends an inch or two from his natural shoulder, yet it does not seem to sag (which looks awful!). Anon #1: "Double Windsor" is a bit of a misnomer. There is a Windsor and a half-Windsor knot. A true double Windsor would be baseball sized! I could have sworn his brown tropical suit in Dr. No (the one he gets held up by Leiter in) had flat front trousers with frog pockets. 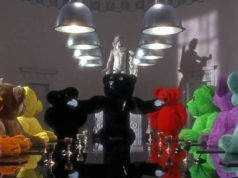 Jovan: You get a clear look at the double forward pleats when Quarrel takes Bond's PPK. And on all of my screens (multiple computers and HDTV) that suit always appears to be light grey. I have a picture of one Japanese poster that turned the suit into a dark tan, and some others that made the tie, which clearly is navy blue in the film, into a rich burgundy. I mostly stick with what I see in the film, and this suit appears to be light grey in all indoor, outdoor, day and night scenes. Is their any problem with a breast pocket on a shirt? Would it be acceptable? A breast pocket belongs only on casual shirts. They are useless if you wear a waistcoat and sloppy if you wear braces. If you are wearing a suit or a sports coat a breast pocket still serves no purpose and just clutters the front of your shirt. Matt, I always thought Connery wore a white shirt with his mohair suit in Dr. No. Or perhaps does he wear a cream shirt and changes it for a white shirt for the evening ? Anyway, if it’s a cream one, that would mean Connery’s Bond had never worn a solid white shirt with a lounge suit in all his tenure as Bond, am I correct ? Do you know why ? Is cream a better colour than white for Connery only, or even for anyone who has a winter complexion ? Connery wears some white shirts in Goldfinger. White looks better on Connery than cream does, but I think they chose cream over white because it may have looked better on film. The Windsor knot bothers me, and not only because Fleming made clear Bond’s disapproval of them. Is it that Connery preferred them? I can’t help thinking about the very high trousers in Dr. No … was he tying this tie in a Windsor knot to make the tie shorter? It’s likely because Connery preferred this knot himself. You can see him wearing a Windsor knot in other films, such as The Frightened City, Diamonds are Forever, The Offence, and Wrong is Right. Matt I haven’t seen you address in any detail the topic of the jetted pockets on these jackets. All things being equal they’re considered somewhat more formal that flapped pockets, are they not? I only really see these on dinner jackets now, to the extent that it makes them seem somewhat out of place on a lounge suit jacket. Was tailoring them like this more of a 50’s style trend that never really came back? Pocket flaps are a sporty detail, which makes them inappropriate on a dinner jacket. But on a suit, there is no difference in the formality of a suit whether or not its pockets have flaps. It’s ultimately a matter of taste and fashion. 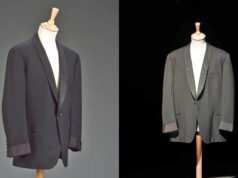 Jetted pockets were still commonly seen on English suits in the 1960s, though the look was predominant on all suits throughout the first half of the 20th century. But jetted pockets on suits did come back. In the 1980s and 1990s jetted pockets on a suit were thought of as an Italian style and the look was very common. Fascinating, that’s exactly what I was looking for. Thank you!